While walking around on Bleecker Street the other night, I passed a window display that stopped me dead in my tracks. What I saw made me question if I’d had more to drink than I’d realized. 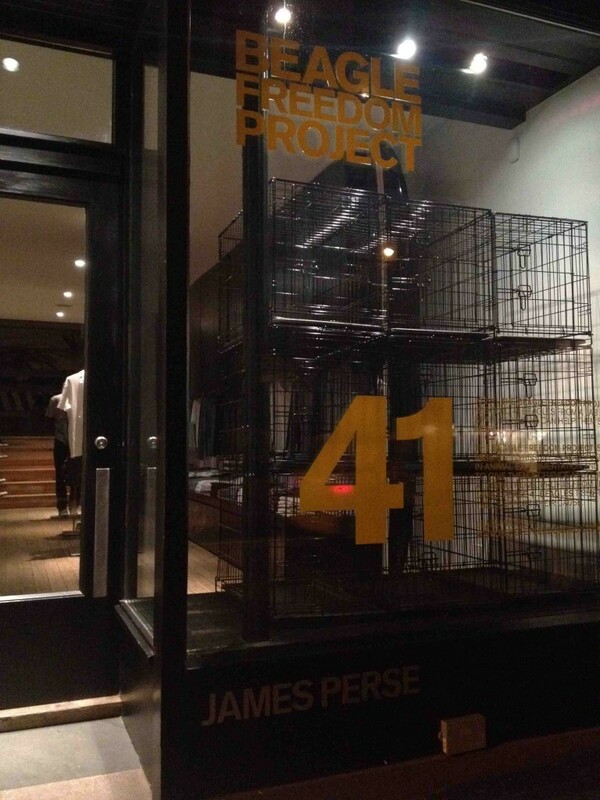 Inside of designer James Perse’s chic storefront, there were ceiling-high stacked cages — all empty. The sparse, cold feel of this display was startling, but even more staggering was the point Perse was making. The display, it turns out, was to raise awareness for the Beagle Freedom Project, a rescue organization founded by activist and filmmaker Shannon Keith, that raises awareness about beagles used in laboratory research, and finds homes for the industry’s victims. I got to know some of the Beagle Freedom Project’s ambassador pups last week, while visiting L.A. The rescued beagles whom I was lucky enough to meet were Frederick and Douglass, the animal companions to Kezia Jauron and Gary Smith, of the changemaking PR organization, Evolotus (be sure to catch Kezia and Gary’s recent podcast interview here on Our Hen House). 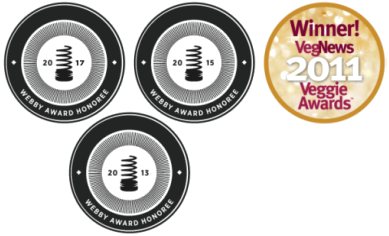 You can actually see the dogs for yourself, as they made cameo appearances in a video interview that Gary did of us for his blog, The Thinking Vegan. 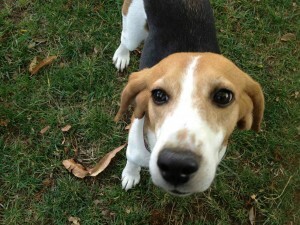 Frederick and Douglass were recent rescues from an animal testing lab, where, like other beagles, they were subjected to cruel and painful experiments, lived every minute of their lives in a tiny, indoor cage, and were denied even their most basic needs — like sun, grass, human companionship, and good food. A few months after being rescued, they are acclimating well to humans, and enjoying their new life, which includes doting and attentive human companions, a big backyard with tons of trees and plants, and a future full of dignity, respect, play — and as much good food and lifelong love as they can swallow. Unmistakably, they still have their issues, but given the unimaginably horrific world that they came from, the fact that these dogs can begin to trust again was, when I met them, enough to give me hope and inspiration — and light a fire beneath me. We human animals simply have got to shed more light on the disgusting world of animal testing. We absolutely must put an end to it. 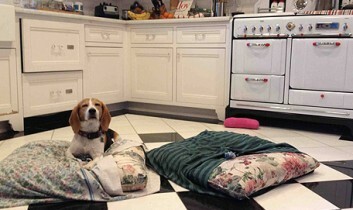 We were lucky enough to meet Frederick and Douglass, 2 rescued beagles who warmed our hearts. That fire I felt is one that designer James Perse certainly knows full well. His display — which is located at both of his Bleecker Street storefronts (and this is prime real estate we’re talkin’ about) — is haunting, but its message is crystal clear. Part of the prominent display includes big bold text that reads: “In 2011, The Beagle Freedom Project rescued 41 beagles from a lab in Spain. In 2012 we can help them save more. The Beagle Freedom Project is a mission to rescue beagles used in animal experimentation and give them a chance at life in a loving home. Profits from the James Perse 41 Beagles t-shirt will support their cause. Learn more at www.beaglefreedomproject.org.” The t-shirts cost $51 and are available in both men and women’s sizes. Reminiscent of another awareness-raising project by fellow designer John Bartlett (don’t miss John’s interview on our podcast) — who launched the Tiny Tim Collection last year, which raises awareness and funds about shelter dogs (and is named after his beloved late pup, Tiny Tim, whom he credits with opening his eyes about animal issues) — Perse’s new undertaking is a stark reminder of the power of “for-profit” activism. If you have a storefront, use the window to create provocative art that raises consciousness about our feathered, four-footed, and/or furry friends. If you don’t have a storefront, but you have a business, create a project that opens eyes and changes behavior (and perhaps also raises funds) for any aspect of animal exploitation that calls to you. Whenever possible, make sure you get press (our aforementioned interview with Kezia and Gary might provide some tips for doing so). There is so much sadness in the world when it comes to animals. It can sometimes (or more than sometimes) feel so overwhelming, and occasionally debilitating. But we have to forge forward anyway, because the only other choice is to remain where we are — and when you refocus on the animals, you realize that is not actually a choice. The beauty of innovative activism like The Beagle Freedom Project, Evolotus PR, The Tiny Tim collection, and James Perse’s powerful displays, is that, behind them, are passionate people who refuse to be complacent, and who are using their skills, talents, interests, and platforms to create change for animals. That gives me hope and inspiration. 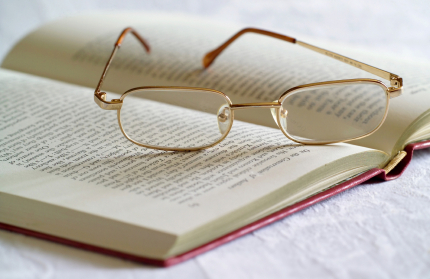 Almost as much so as Frederick and Douglass, whose little faces have stuck with me since we met, and whose little stories are actually so big that they haunt me, and motivate me. 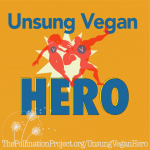 Our Hen House Announces The Unsung Vegan Heroes Winners! I wish I had the name of the store but in the "swanky" mall at Caesars in Las Vegas, there is also a storefront which is much like the picture above, bringing attention to these beautiful Beagles. Thank you. That was a beautifully written piece. You should be very proud of yourself. Thanks to you and all the wonderful people who are raising awareness to this horror. @ Janet, that's another James Perse location.